Dell is set to introduce new Medical Review 24 Monitor (MR2416) at the Radiological Society of North America (RSNA)’s 2015 scientific assembly and annual meeting in Chicago, which will be held from 29 November to 4 December. The firm has developed its first medical monitor for the healthcare environment. Dell Medical Review 24 Monitor features an anti-reflective edge-to-edge covered glass on the front and fully sealed design. It can withstand cleaning agents of up to 75% concentrated ethyl alcohol solution. The monitor is graduated to the Digital Imaging and Communications in Medicine (DICOM) part 14 standard grayscale, enabling healthcare professionals to review accurate, consistent images at the point of care. To provide compatibility with most image-enabled electronic medical or healthcare record (EMR/EHR) applications, the monitor was designed to have 24in of diagonal viewing area with 1920 x 1200 resolution. Healthcare professionals can switch the monitor’s orientation between landscape and portrait, while reviewing or sharing images with patients. Dell global software and peripherals GM and vice president Bert Park said: "As the number-one monitor brand in the world, we want to bring our innovation and expertise in display technology to the healthcare field with a selection of medical-grade Dell monitors. "The MR2416 is the first in a line of products we will be introducing to enable healthcare customers to improve their efficiency and service quality." 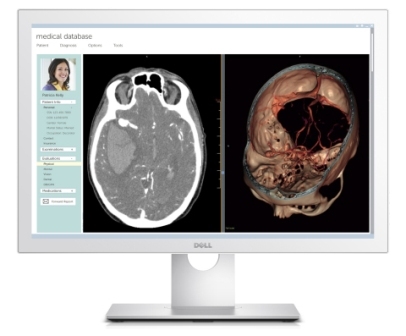 Image: Dell Medical Review 24 Monitor addresses common needs of a healthcare environment. Photo: courtesy of Business Wire.